Use the form below to inquire about Quaint Portuguese Style Homestay at Curtorim . Use the form below to reserve for Quaint Portuguese Style Homestay at Curtorim . This room is located on the first floor. The room has wooden flooring, is filled with an antique four-poster bed, a private terrace and a separate dressing area. This is a large room with a king-sized bed and antique furniture. This room has an attached balcony, a four poster bed, old rocking chairs and opens out into the rear courtyard. 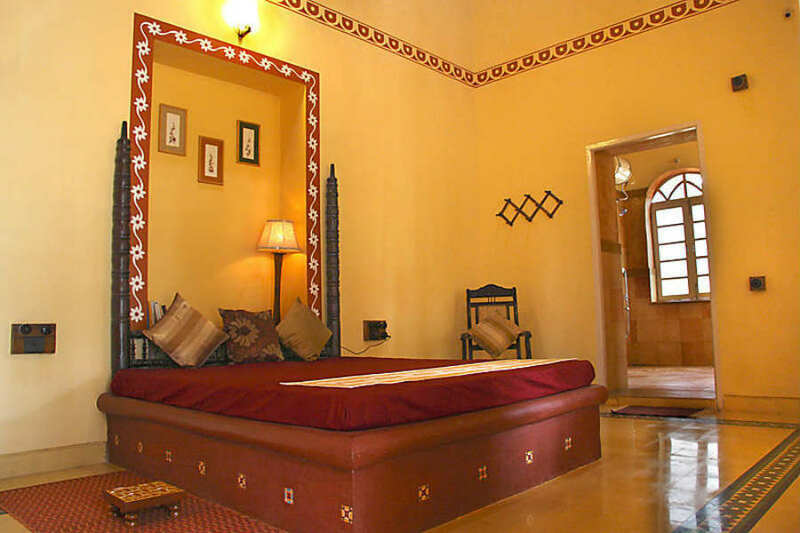 This room overlooks the gardens and the lake and has a huge bed made of laterite stone dotted with beautiful handmade tiles. This room opens out into the dining area and has a double bed. Original false ceiling has been retained. Make the most of your laid back moments at this Quaint Portuguese Style Homestay at Curtorim. While the sun, sand, and sea add to the serenity of Goa, this Quaint Portuguese Style Homestay at Curtorim, makes your stay more than memorable. A holiday in Goa is on every traveler’s wish list. There are some who visit the coastal state once in their lifetime then there are some who make a visit to the sun-kissed beaches of Goa an annual pilgrimage. Flowering bushes, fruit trees, and verdant lawns overlook a seasonal lake, all on the property of the homestay. The accommodation at this homestay does more than just complement its grandeur with five spacious rooms equipped with all the amenities you would need for a comfortable stay. Named after the colors of the rainbow, the Violet, Indigo, Blue, Yellow, and Orange rooms in the homestay are all colored as per their name. All the rooms are enabled with Wi-Fi, have an ensuite bathroom, and a constant supply of hot and cold water. The Indigo room and Orange room are air-conditioned rooms while the Violet, Blue, and Yellow rooms are non-AC rooms. The interiors of all the rooms are tastefully done with antique furniture to go with the color and the decor of the room. Everything from the high ceilings and imposing columns to the furniture and the decor at this Quaint Portuguese Style Homestay at Curtorim is reminiscent of a bygone era. Its location away from the hustle and bustle of the city is an icing on the cake. If you want to spend a rejuvenating holiday and embrace the Goan way of life, this centuries-old Portuguese Manor is the right place to be. A maximum of four people, including two adults and two children below 12 years, can be accommodated in every room. Lunch / Dinner can be arranged on prior notice at an extra charge of Rs. 700/-person per meal. Reservations are confirmed on a 100% non-refundable payment done via bank transfer. Special rates apply for long stays. The standard check-in time is 12 PM and check-out time is 11 AM. Charges vary for low and high seasons. The full booking amount will be refunded if cancellation is made up to 15 days before the check-in date. Cancellations made up to 7 days before the check-in date will incur a 50% cancellation charge. No refund will be made if a cancellation is made less than 7 days before the check-in date. A tourist hotspot, Goa is a haven for not only party lovers but also for those looking for a quiet moment with nature. From walking along the shores of the Zuari River and exploring the archaeological wonders of the region to spotting the many varieties of birds that are regulars at Curtorim, you can do it all during your stay at the homestay. Go on a heritage walk in Chandor village and visit St. Alex Church, one of the oldest churches in Goa. You could also cycle to the Rachol seminary, which is the oldest in Asia, and explore Raia, Loutolim, Chandor, and Margao to get a first-hand experience of the way of life in the region. Or head to the Zuari River for a boat ride with the local fishermen or a relaxed cruise in the winding river. When you’re not relaxing in the lush landscape of the homestay or birdwatching in and around the area, check out some of the less crowded beaches of South Goa, including Benaulim Beach to unwind or Colva Beach for different water and adventure activities. Whatever you do, don’t forget to indulge the photographer in you. You will find many a muse in the beautiful locales of South Goa. Goa International Airport at Dabolim is the nearest airport at a distance of about 32 km from the property. The international airport at Mangalore (350 km) is another option. For those who love to travel by train, the route to Goa is more scenic than you could ask for. The nearest railway station to the property is in Madgaon, at a distance of about 12 km. Vasco da Gama, another major railhead in Goa, is 32 km away. Goa is connected to many major cities in India by road. If you’re driving down from Bangalore, the trip covers a distance of about 580 km. National Highway 66, which passes through Goa, connects the place to Mangalore as well as Mumbai. Nearby towns and major tourist attractions include Margao (10 km), (Panjim (40 km), and Mapusa (53 km).